Daniel Alfredsson will announce his retirement in Ottawa next week. Despite the tumultuous end to his tenure with the Senators before last season, the former Senators captain is planning to retire in Ottawa where “Alfie” starred on the ice and served in the community for 17 years. Originally, speculation suggested that the retirement celebration would happen on Monday when the Senators visit the Red Wings in Detroit. But retirement in Detroit? For Daniel Alfredsson? Coming to Ottawa with the family on Dec. 4th. Looking forward to see everybody! #HappyThanksgiving #drycake? Daniel Alfredsson: How Will the Former Ottawa Senators Captain be Remembered? The tribute video gives a good sense of the likely tone for the evening. Time has passed since Alfredsson bolted for the Red Wings after the botched contract negotiations over a year ago. Though the relationship between Alfredsson and the Senators crumbled, both sides now seem ready to honour the former captain in the right way. They could have stayed estranged. Alfredsson could have remained bitter because, for a variety of reasons, his contract wasn’t extended in Ottawa after he played out the final year of his contract (2012-13) for a measly million dollars. This is where [Bryan] Murray, the ailing general manager of the Senators, stepped in to welcome Alfredsson home. Valiantly carrying on his duties while battling terminal cancer, Murray was not about to let the Alfredsson estrangement fester any longer. Alfredsson is managing career-ending back issues. Murray is fighting terminal cancer. For the pair, their “Motown Drive” in Detroit on November 24th was enough time for two men dealing with much larger issues to put a small feud behind them. Now, Alfie will return to Ottawa, where he played for 17 years, scoring 1108 points in 1178 career games as a Senator, won the Calder Trophy in 1995-96, won the King Clancy Memorial Trophy in 2011-12, and made the All-Star team six times. A legacy this great was too good to ruin because of a contract mishap. On December 4th, Senators fans will have one last chance to chant “Alfie! Alfie!” when the scoreboard timer flashes 11:11 in each period. Alfredsson’s familiar #11 will rise to the rafters. And the Senators, for the first time in their modern incarnation, will celebrate the career of an all-time great: one who helped to create a “Sens culture” that the likes of Alexandre Daigle, Alexei Yashin, Radek Bonk, and Dany Heatley never did. What do you think, Ottawa Senators fans? 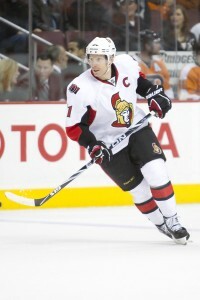 Are you ready to forgive Alfredsson or is it too soon to forget the botched contract situation of last year?